Jean-Luc Nélias, the man who helped mastermind Groupama's win in the last Volvo Ocean Race, will take over as navigator for Spanish boat MAPFRE for the second leg of this edition, starting on November 19. Nélias (FRA) was also navigator for Franck Cammas's winning crew in 2011-12. He replaces Nico Lunven (FRA) in the MAPFRE crew that finished seventh in the opening leg from Alicante, Spain to Cape Town on Friday (November 7). Nélias had already been working with MAPFRE as a weather analyst. The team also announced that Michel Desjoyeaux (FRA), the twice Vendée Globe winner on board for the first leg, will not be sailing any further stages in the 2014-15 race but remains available to assist the team from on-shore. MAPFRE emphasised that it was never planned for Desjoyeaux to sail the entire race. Desjoyeaux told Volvo Ocean Race: "The decision (for me) to no longer sail on board MAPFRE was taken by the team and me. They are not easy decisions to take but it's also part of the life of a team. Even if I'm no longer sailing, I've not wasted my time. MAPFRE is a great team with really good guys on board." His replacement will be announced in the next few days, the team added. The team said their one-design Volvo Ocean 65 boat had arrived in Cape Town generally in good shape despite some relatively minor problems with the engine, batteries and other small breakages. 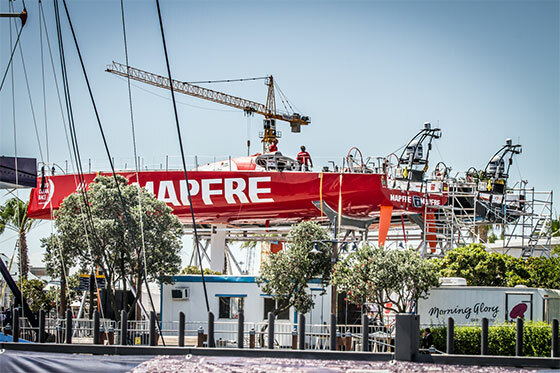 In all, MAPFRE sailed a total of 8,525 nautical miles (nm) and would have secured sixth spot on Friday had they not ran into an almost windless area under Table Mountain shortly before the finish. Team SCA took advantage to sail in on a more favoured course and snatched sixth instead. The Spanish boat will be back in the water on Tuesday (November 11), preparing for the Cape Town in-port race on Saturday, November 14. The seven-strong fleet departs for Abu Dhabi, a distance of 6,125nm, on Wednesday, November 19.